Anyone who has ever travelled to the lower part of South America, should not leave without having tasted Chilean (Carménère) or Argentinian (Malbec) red wine. Where to find the most extraordinary hotel rooms, the most elegant wine and star-studded skies? Find it out here! If you have ever dreamed of finally taking some surf lessons, Pichilemu might be the best place to do so along the coast of Chile. However, be aware of the fact that the success rate of becoming a pro surfer after a weekend is rather low (read more). For a unforgetable stay in Pichilemu, the Hotel Alaia definitely is the place for the perfect getaway. 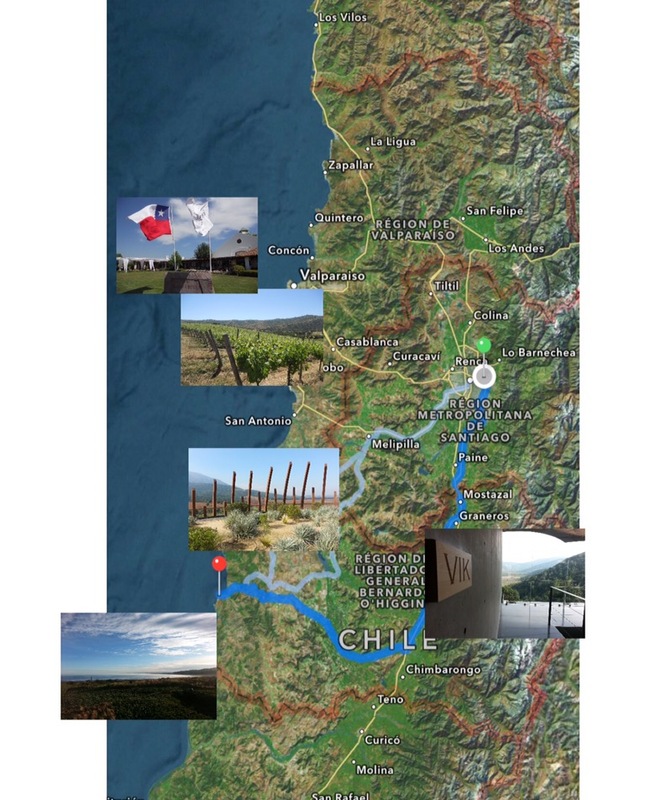 There are three possible routes to go there (see map below), whereas the longest one leads you through the Santa Cruz Valley, which is quite well known for its numerous wineries. Before going to the Santa Cruz Valley, it`s highly recommendable to book a stopover (for a wine tasting at least) at a very unique and spectacular place: The Vik Vineyard in Millahue. This rather young winery was founded by the Norwegian entrepreneur Alexander Vik and aims to produce the best wine in the world in a couple of years from now. In case you are looking for a very special place to stay over, the Vik Hotel`s architecture will leave you breathless. The vineyards “Montes” and “Lapostolle” are probably the most popular ones in this area, whereas the latter also belongs to”Relais & Chateaux”, a global fellowship of individually owned and operated luxury hotels and restaurants. Valparaiso is the perfect destination in case you don´t have that much time and want to see more than just Santiago. Going there only takes you about 1 hour and a stopover in the Casablanca valley will definitely pay off, especially when you are looking for a nice option to have a decent lunch. The vineyard “Casas del Bosque”might be the best location to do so, especially when you are more into white than red wines. Their “Sauvignon Gran Reserva” is very well known far beyond Chilean borders and the restaurant offers a variety of great dishes too. Looking for another options in the Casablanca Valley? The wineries “Matetic” and the “Bodegas RE” are worth a visit as well, both offering special wine tours and tastings.